Welcome to Issue 3 of Gizmopolitan! And hot on the heels of issue 2 comes issue 3 with some festive advice for making the best of Winter Veil! People keep volunteerin to work here, and producin really good stuff - welcome to Ashdew, Dhrizzle, Kaia, and Skathi our talented new Gizmo freelancers publishing for the first time this issue! In this issue we have the usual naked guy (yeah I know which page you flick to first...) in this case silvertongued corsair Chaco "He can talk you to heaven!" sighed one of our readers. Plus the chance to marvel at other people's Fashion Mistakes (you hope it wasn't you we snapped on your Bad Hair Day), find ideas from Ashdew for that Winter Veil Party you want to throw or a present for the man in your life - plus the mind-boggling strategic advice from Life Coach Lady Venita, Juna's advice on how to mend a broken heart and Kaia's advice for those wantin to look good on a budget... We also have Skathi exploring the life of women in plate, while Dhrizzle explores fashion for warlocks. Will our next publication be Gizmo or something else?... See In the Pipeline for more grandiose plans from the team! You want to wow people with your sophisticated flirting and your suave repartee? Would love to attract attention but can't find the right words? With /gizflirt you can attract all the attention you want! Try it with strangers! Try it in Guild! 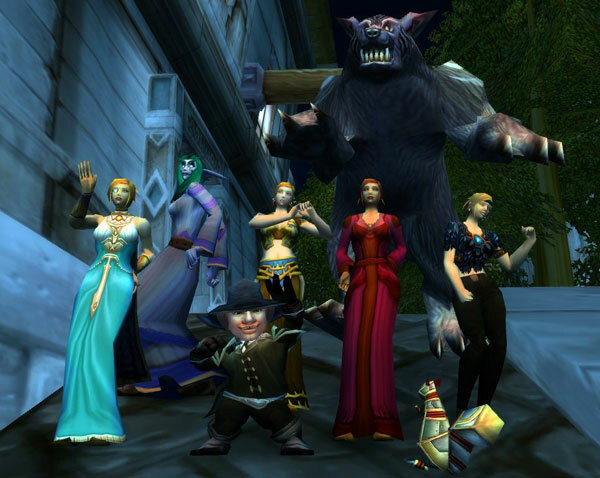 Get creative like the Stormwind Guard and create mayhem as the device triggers others in the vicinity! Turn in your voucher for a FREE! FlirtByGizmo at this shop! FlirtByGizmo may sometimes deliver unpredictable results, due to the Gizmo team's weird sense of humour. Flirtation using this device is entirely at the user's risk. The publishers and editors of Gizmopolitan disclaim all responsibility for injury, loss or relationship or guild breakdown resulting from use of this device. 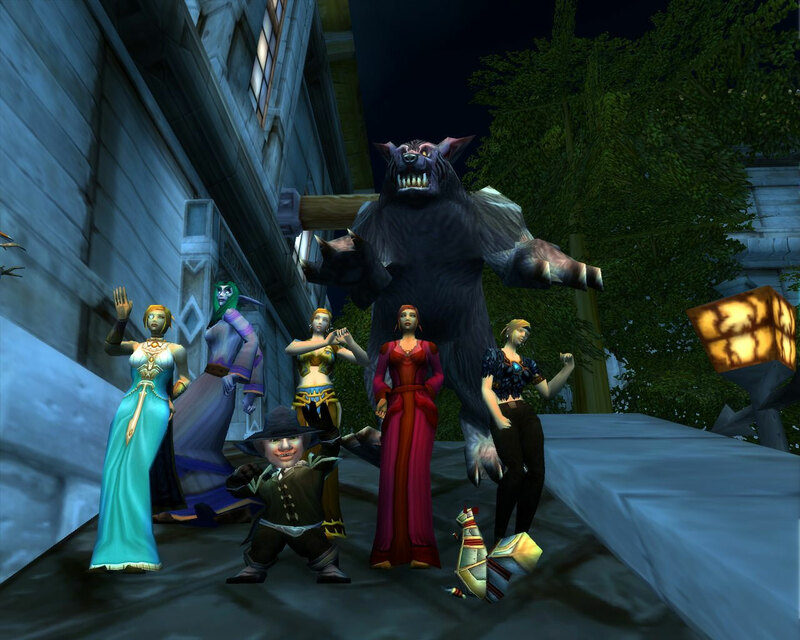 Brannwen, Merana, Duston, Aylania, Iralla, Thorn (in bear form) and Chit with Scribble the mechanical mascot, outside the Gizmo offices in Stormwind. Our Writers Juna, Ashdew, Chit, Venita, Kaia, Skathi, Dhrizzle and the wonderful readers who submitted personal ads and wrote to Dear Gizmo! Our Photographers Arainne, Ashdew, Awyin, Chit, Dhrizzle, Iralla, Kaia, Merana, Skathi. Earthen Ring EU - Anabela, Ilusien, Jhaede, Melinne, Mincha, Naiah, Namarathar, Sarae, Skathi, Tee. Magtheridon EU - Merana, Ungen. Ahn'Qiraj EU - Aliens, Ashdew, Druberry, Gingerbuns, Havoc, Lilithine.